« Best Cordless Drill – What Qualifies as Best? Now that your house has been finished, you can move on to putting the right floor finish to it. 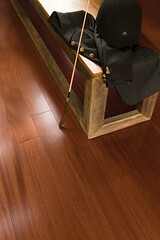 You can choose from a lot of options, but as of now, hardwood is the most popular. Installing hardwood floors is hard, but cleaning hardwood floors is even harder. With installing, it is a one-time task that you need to finish. Afterwards, you do not have to think about it. However, cleaning is a constant process that you should never forget because hardwood floors can easily be ruined by neglect. There are different forms of neglect when it comes to hardwood. The first is neglecting to clear it off of dusts and dirt that may be scratching the surface. These scratches can cause the floor to be more prone to flaking and breakage. No matter how small the scratches are, when they become more frequent, they can already be seen by people who will look at the floor. Another form of neglect is not being careful when it comes to liquids. You may have spilled milk accidentally on the surface, but if you wipe it off quickly, damage can be prevented. However, if you just wipe it off haphazardly or just let it dry, you are allowing it to coat your floor with dirt, which can lessen its shine. Again, that can be seen when people look at your floor. Even your furniture can harm hardwood when their feet scratch the surface. It would be better to lift chairs or tables when you want to move them rather than just dragging them about. Cleaning hardwood floors should become a habit. Hardwood sure is a popular choice among floor types, but if you do not take care of it properly, you might as well choose one of the others that do not require too much attention.